Premium Sneaky Brand shoe tree. Spring loaded shoe tree with extra wide toe box for use all trainer shapes and sizes. Keep long lasting trainers and sneakers shape and free from creases. A shoe tree is a device that is used to keep the shape of a shoe or trainer. A shoe tree can help prevent shoes from developing creases and forming a warped shape and helps provide a longer life for the shoe or trainer. Many sneaker collectors will use shoes to keep a well preserved shape to their trainers. Shoe trees are useful for those who wear shoes without socks. Sweat is often absorbed into the shoe and causes the trainer to warp and loose shape. Benefits of a shoe tree. When to use a shoe tree. A shoe tree should be used once you take of your shoes. This should be done in a timely manner as the shoe tree will help the sneaker keep its shape as it dries. Many believe that once the shoe has absorbed the moisture, there is no use for a shoe tree. Often after 24 hours. 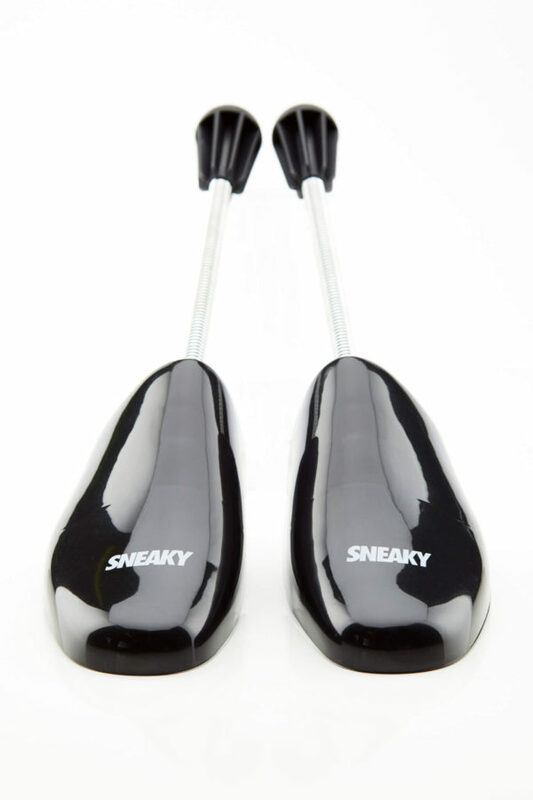 The Sneaky Brand Sneaky Shoe Trees are lightweight made from plastic and aluminium with a coiled spring stem. As they are lightweight, they are ideal for travelling. The plastic shoe tree keeps the shoes shape often better than other materials.